Seismic is at it again -- this time rolling out the new 76mm x 59mm Hot Spot. These super-sized Hot Spots are poured in Seismic's latest Black Ops urethane formula and feature the new Seismic Mini-EC core. Not too big and not too small, the core preserves ample tire thickness while saving over 1/2-ounce per wheel and super-charging inside edge rebound. The result is a big, wide wheel with superior traction and roll; smooth, predictable handling; and the quickness of a much smaller wheel. 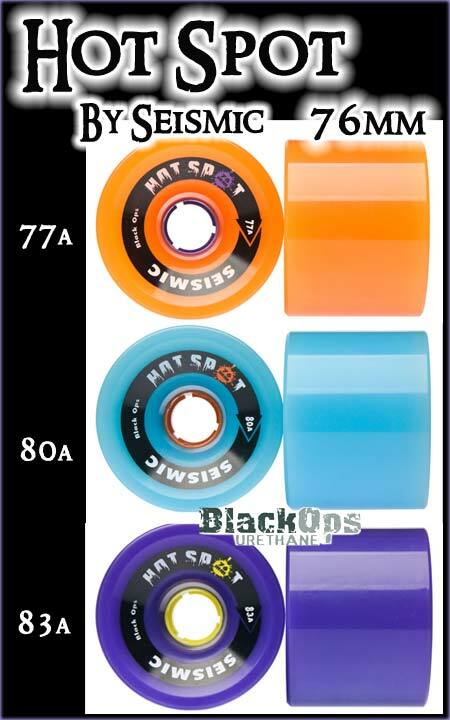 Specs: 76mm tall x 59mm wide -- Offset bearing, dual lip design in colors/durometers listed below. Sold in sets of two wheels. For highest performance, use a softer duro at the tail (where thrust is generated and grip is most critical) and a harder duro at the nose (to optimize roll speed).